Iaido = The way of drawing the sword. Kendo = The way of the sword, already drawn. 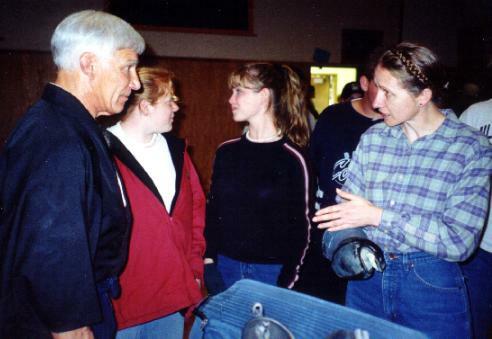 Jim Sylvia is a retired instructor and coach from College of the Redwoods. 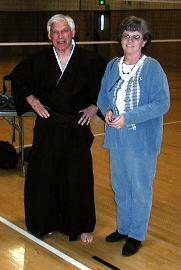 He has studied Kendo and Iaido for many years -- and is ranked in both sports. When he heard of his old friend's FMF study trip to Japan, he volunteered to offer a different perspective. 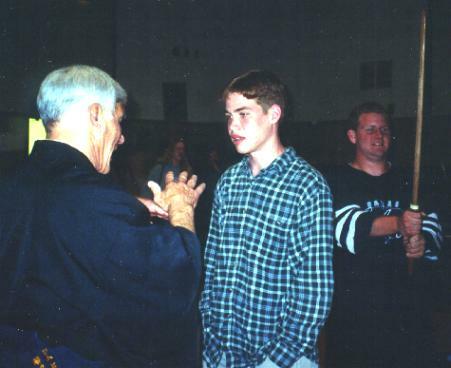 He appeared at Southern Trinity on April 12, 2000 for a morning presentation to the elementary school and an afternoon show for the high school. 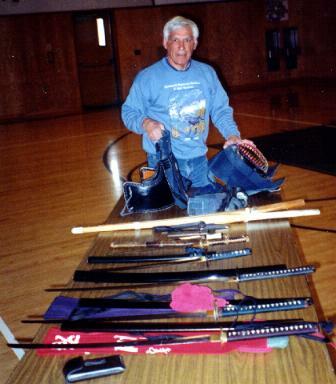 Mr. Sylvia unpacks his assortment of swords and protective armor in preparation for his two talks at Southern Trinity. 6th, 7th, and 8th graders from Van Duzen Elementary watch the slides of Mr. Sylvia's 1982 sabbatical study of kendo in Japan. 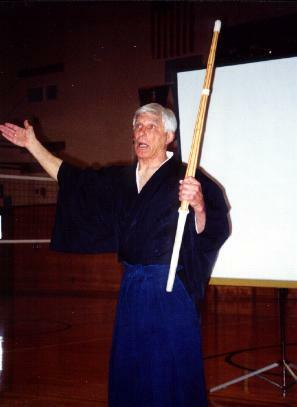 Mr. Sylvia describes the competitive sport of Kendo and the bamboo swords used. 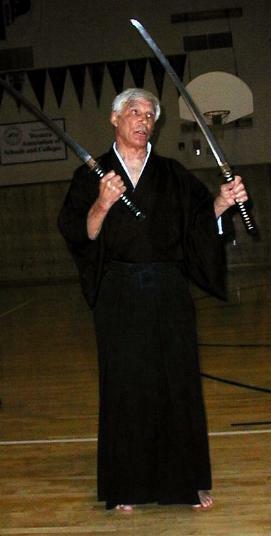 Here Mr. Sylvia demonstrates two styles of Japanese swords and describes the differences of types and qualities. 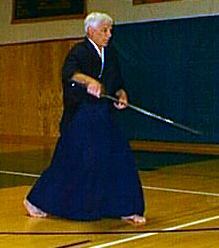 This photo shows the art that is Iaido -- the drawing of the sword using focused concentration and precision with balance and grace. 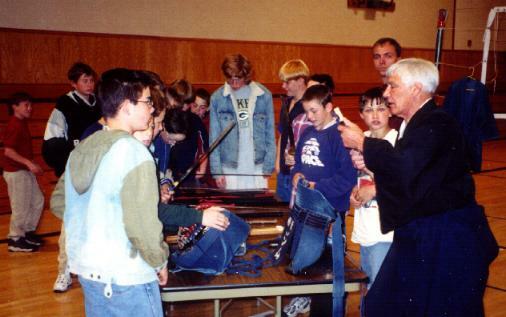 It was exciting for the Van Duzen students to be able to handle the swords and ask questions of Mr. Sylvia. 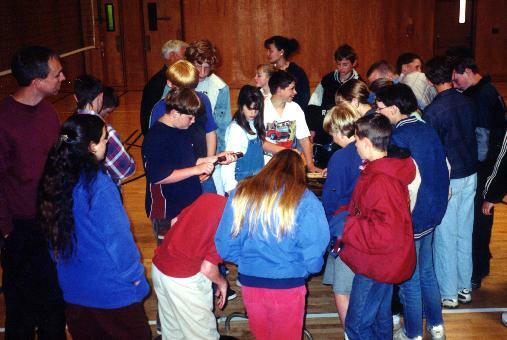 Van Duzen students crowd around the display under the supervision of Mr. Heaton. 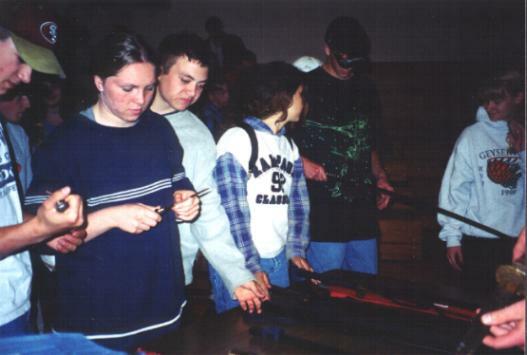 Southern Trinity High students check out the cutlery after the afternoon presentation. Bretton Maybee gets a thorough answer to his question about the Japanese martial art while Kenneth Neumiller considers the wooden sword. Mrs. W. asks one of her notorious questions. This one must be about the protective gauntlet or the cutting stroke to the sword hand. 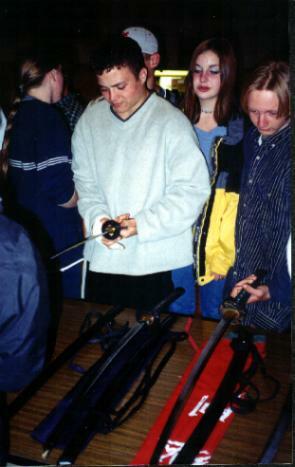 Southern Trinity Sophomores check out the sword display. Mr. Sylvia and Mrs. Wheeler share different perspectives on their two rather different experiences with Japanese culture and tradition.